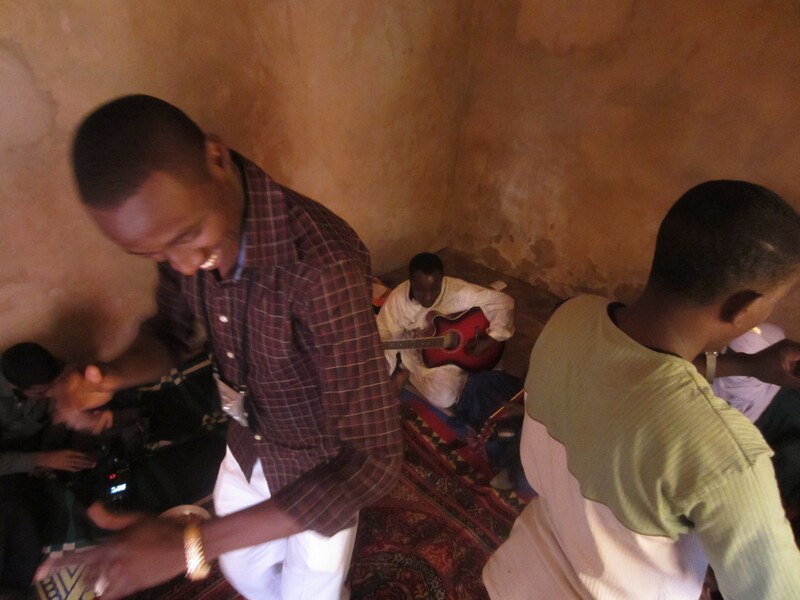 Haïdara and Abdoulaye live with their friends in a compound on the fringes of Niamey, the capital of Niger. The two concrete buildings house perhaps thirty students who have come here to attend the University. 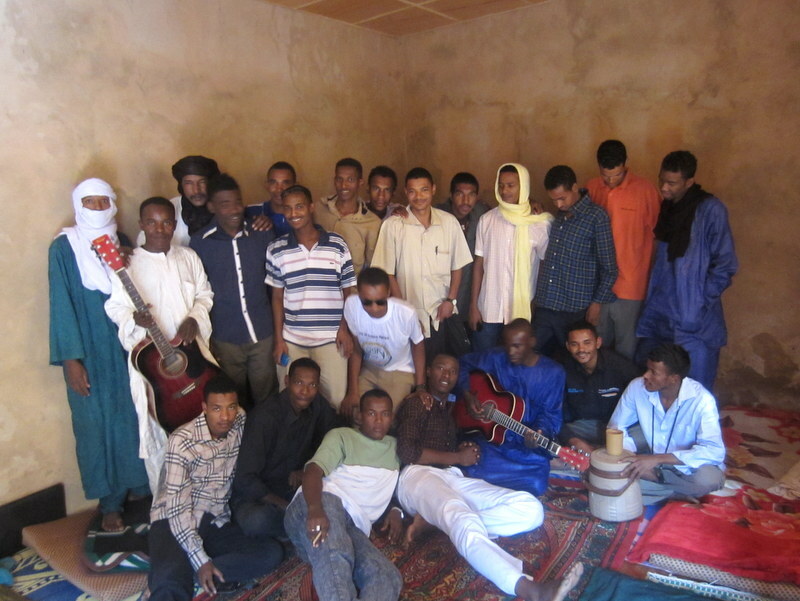 They are all from the town of Timia, an oasis in the Aïr mountains far up into the North of Niger. They are all here to study. Though Niger is in theory one country, there remain divisions between the North and South – and huge differences between the cities and the country. As representatives of Timia, the student group is, in essence, a community in exile. Like immigrants living abroad, they maintain their connection to their home, visiting on vacations, and collectively forging a small enclave of Northerners. 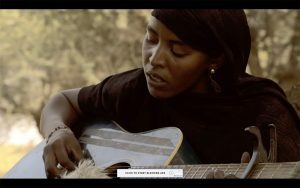 Although far removed, here they have the benefits of global connectivity with regular access to the internet – in fact, I first meet the group via Facebook, who knew of my impending visit, send me a short audio recording of Haïdara and Abdoulaye playing guitar. When we do finally meet, we are received with some fanfare. Nearly all of the students living in the house are crammed into one of the rooms to receive us – though I suspect more for Ahmed, from Amanar, whose stardom precedes him. 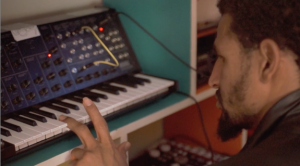 His sometimes cynical lyrics chastise the powerful and corrupt and demand the creation of a Tuareg class of intellectuals, and we are at the exact people that he’s trying to reach. While Haïdara and Abdoulaye play guitar (perhaps more for Ahmed then for me) a youth named Adouma scrolls through a Word document on his laptop, anxious to share one of his projects. Contingent with his studies at the university, he has written a textbook with audio lessons for the Tamashek language of Niger, with accompanying Tifinagh. In the North, the road to prosperity has been limited to a few options – the unpredictable tourist industry, the long shot musical career, competitive posts in the numerous NGOs, or dangerous black market smuggling. One of the continued complaints in the North is directed at the lack of education and opportunity – not always eloquently manifested, but expressed in a constant series of rebellions over the past decades. When I lived in pre-rebellion Kidal, I regularly met with youth who would become instrumental in the overthrow of the Malian state, particularly in the utilization of technology to distribute their message. In a cyber cafe of the now-defunct Maison de Luxembourg, I watched what would become an MNLA website launched on Blogspot. Even then, the youth were ready for revolution, enamored with Che Guevara and inspired by the idealism of youth culture. They were already beyond peaceful reconciliation, products of Northern schools that for the most part, ignored them. Teachers from the capital, assigned to these outposts, were unable to speak Tamashek and even the most dedicated could be forgiven in their apathy – sent to unfamiliar territories, with little or no support from the capital, they too were far from their families. Needless to say, Tuareg culture was not taught. I visited the Kidal high school library, and could not find a single book referencing the Tuareg. When I suggested to the soon to be revolutionaries that they compose an open letter to the Minister of Education demanding support and books, the idea seemed too small and inconsequential. Growing up in the shadow of Bamako, the Northern territories had too long existed in limbo, and their big dreams demanding big ideas. While post-rebellion Niger has followed a much different route, the student group from Timia is hopeful, a model of a new class that may usher in changes in the North countries. As ambassadors or immigrants in exile, they remain “enfants de Timia”. 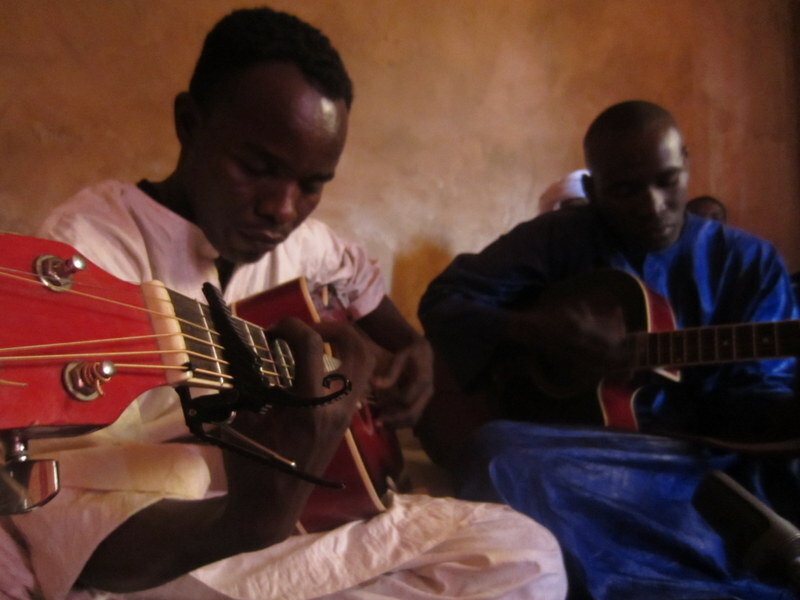 While Haidara and Abdoulaye play guitar, their compositions are not remarkable for their unique style – but in their purposeful nostalgia creating an oasis in the capital. It is not just symbolic, but a very real and pragmatic collective environment where resources are pooled to support one another in their struggle. When Ahmed is out of the room, the students whisper to one another, finally asking if Ahmed will play a song. I ask him, but he politely refuses to their disappointment (though they do their best to hide it, and are somewhat allayed by a group photograph with the star). When we leave, I ask him why he wouldn’t play, and why he seemed discouraged. But it was March, the rebellion had just begun in Mali, and his family was left behind. The message that was so readily embraced by the students of Timia had not been heard at his home in Kidal, and now war was raging. Interesting reading. You really bring the sense of place to this post. Love it.